New research supports claims by small island nations that one-half degree in climate warming makes a difference. The Paris Climate Agreement signed at United Nations headquarters last week (April 22) included two temperature limits: 1.5° and 2.0° Celsius above pre-industrial times. The additional 0.5°C would mean a 10-centimeter-higher global sea-level rise by 2100, longer heat waves, and a greater threat to virtually all tropical coral reefs according to the study by a European team of researchers. Lead author Carl Schleussner is a climate scientist with Climate Analytics in Germany. “Our research confirms that 1.5° would be a substantially safer limit of climate change,” he said. 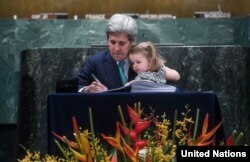 The scientists analyzed climate models used in the Intergovernmental Panel on Climate Change Fifth Assessment Report. They focused on projected impacts at 1.5° and 2.0° Celsius in 25 regions worldwide for 11 indicators, ranging from crop yields, water availability and extreme weather, to coral loss and sea level rise. The findings are not uniform across the globe. On the other hand, tropical regions would bear the brunt of an additional .5° Celsius warming by the end of the century. “Warm spells would last up to 50 percent longer in a 2 ° world than at 1.5° Celsius,” he said. “There we see a strong regional decrease in productivity, a doubling in yield reduction of wheat and maize between 1.5° and 2°," he added. 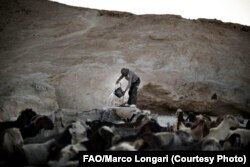 A Palestinian farmer harvests water from a well for his goats and sheep in a region suffering from water scarcity, which will get worse as planet temperatures rise. Another hotspot is the Mediterranean, including North Africa and the Middle East, a region already feeling the impact from water scarcity. Available water is expected to decline by 10 percent with 1.5° warming. “This will double to about 20 percent at 2°,” Schleussner said. Coral reefs, which harbor marine species and protect coastlines, might have more time to adapt under the lower target. At 1.5° warming, the rate of sea level rise could also slow down considerably. Schleussner said the study confirms the scientific validity of what the poorer, developing countries had called for and eventually got in the Paris Agreement. He hopes it helps policy makers and the public make more informed decisions on climate change. 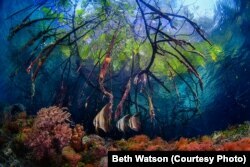 Coral reefs like this one in Raja Ampat, Indonesia are at great risk if the planet warms two degrees Celsius higher than pre-industrial times.